Creating your own swag light is an easy way to add overhead lighting to a room that would not otherwise have it. A swag light can be plugged into a regular outlet, creating an overhead lighting option for apartment dwellers or dorm tenants who do not have the option to alter the electrical work. This project, made with a hanging lamp cord kit, is quick and easy and will produce a budget-friendly lighting option for any room in the house. Determine where you would like your swag light to hang and place a small dot on the ceiling with a pencil. Hand screw a tea hook into the ceiling where you marked and turn hook until tightened. 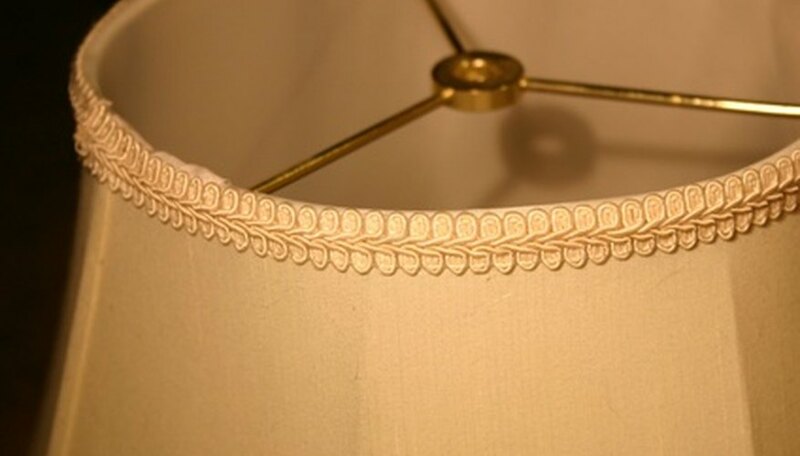 Using the hanging lamp cord kit, thread the cord through the uno bracket inside the lampshade. The light socket should fit snugly against the uno bracket. An uno bracket is the cross bracket inside the lampshade that has a small circle allowing the bulb to face downward when hanging. There is no need to secure the socket to the bracket when hanging. Feed the exposed cord into the swag light cover. A swag cord cover is a tube of fabric that is specifically designed to cover hanging lamp cord kits. Bunch the fabric decoratively over the cord. Hang the light from the tea hook that you previously screwed into the ceiling. Place a second hook into the ceiling above an electrical outlet. Swag the cord to the next hook, making sure that you leave enough cord remaining to reach the outlet. Screw the light bulb into the socket and plug the cord into the outlet. Adjust the light for optimal use. A chain may also be used to disguise the cord; many are often sold for this purpose. Do not use a shade that comes into contact with the bulb; this may cause a fire. Rachael Cearley is an avid reader, writer and a lover of the written word. She has been writing personally and professionally for five years. You can find her work most recently published in the "Fort Wayne Family Magazine."